The Digitech-i Microscope is a fully functional magnification device which can easily be operated by plugging directly into your computer enabling you to magnify objects up to 200x. Enhanced with adjustable light control wheel with 6 white LED lights and a 2.0MP digital camera, the USB Microscope can capture high quality images and videos (AVI). The full package includes a user friendly image processing software, a lens cover and a detachable stand. Additionally, this high end digital microscope requires no batteries, receiving its power directly from the computer's USB power. 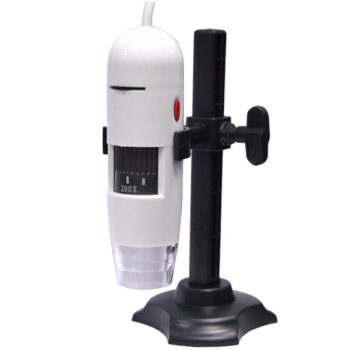 The USB Microscope's compact and innovative design, as well as its easy accessibility option make it a perfect candidate for classroom projects for scientific teaching and research.